Admission to the Visitor's Center and City Gallery is free. Monday - Saturday 10:00 a.m. - 6:30 p.m., Sunday 10:00 a.m. - 5:00 p.m. 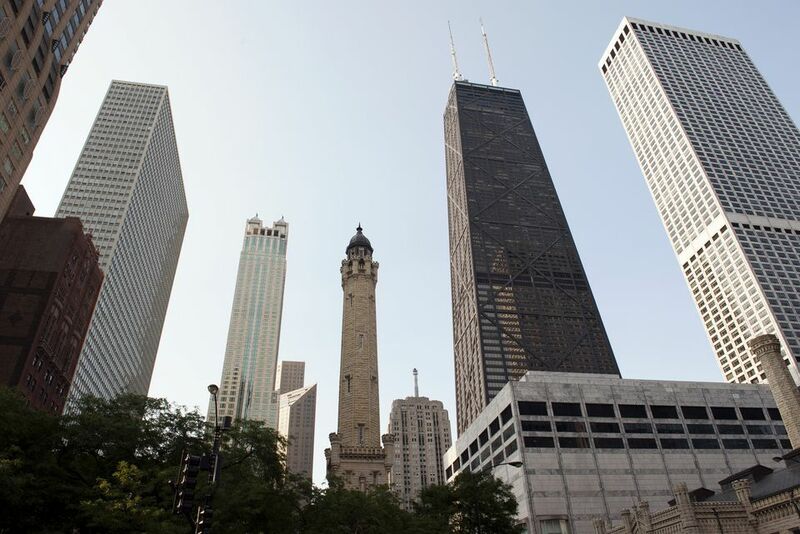 Even though it stands in the shadows of the tall buildings surrounding it, such as the Hancock and Water Tower Place, when the historic Water Tower was first built in 1869, its 154-foot height was probably pretty impressive. The Water Tower was commissioned to house a 138-foot tall standpipe, which helped with water flow and pressure for the pumping station. But the Water Tower's main claim to fame is that it is one of only a very few structures that remained standing after the great Chicago Fire in 1871 and today is a monument to that event. While it has served in its original use since 1911, it is a popular tourist attraction of the Magnificent Mile. The Water Tower is home to the City Gallery, the "city's official photography gallery," which presents Chicago-themed photography exhibitions by Chicago photographers. The pumping station (which is still operational) has a Visitor's Information Center that provides tons of free pamphlets and information about what to do around the city. The Water Works building has been converted to a live theater space and is currently the base for the well-known (thanks in part to the fame of one of its co-founders, David Schwimmer) Lookingglass Theatre Company. Art Institute of Chicago: The distinguished destination serves as one of the world's most recognized and significant cultural museums, and it's only a couple of blocks south of the Mag Mile. Visitors will be thrilled to discover that within the district's boundaries exists venues catering to specific genres, from the sports-centric Chicago Sports Museum to the natural history artwork at Joel Oppenheimer, Inc.
Buckingham Fountain: Located in Grant Park is one of Chicago's most recognizable landmarks, and its hourly water show in the summer is fun for young and old. The Buckingham Fountain is Chicago's centerpiece along the Lake Michigan shore and is a popular destination spot for visitors and locals alike. Made out of gorgeous pink Georgia marble, the real attraction of the fountain is the water, light, and music show that takes place every hour. Controlled by a computer in its underground pump room, it's a dazzling display that makes for a fantastic photo opportunity and a picture perfect background--which is why you'll inevitably see a wedding party having portraits taken there during milder weather. Chicago Sports Museum. The city's first-ever sports museum is comprised of 8,000 square feet and offers an interactive, high-tech experience, unique sports memorabilia (think Sammy Sosa’s corked bat), and an impressive collection of local sports artifacts. The Hall of Legends gallery highlights an array of “play with the legends” baseball, basketball, football and hockey interactive games, such as "defending the goal" with Blackhawks star Patrick Kane. Lincoln Park. Lincoln Park is not your average city park. Sure, it has trees, ponds, and large grassy spaces, but from its humble beginnings as a small public cemetery, it has grown to more than 1,200 acres and has a number of fun activities. Included in the park are Lincoln Park Zoo, a gorgeous sandy beach, a beautiful and tranquil conservatory, and the Peggy Notebaert Nature Museum. Richard H. Driehaus Museum. This historic destination was once known as one of Chicago's wealthiest homes during the 19th century. It was then known as the Samuel M. Nickerson House, a mansion so grand in architecture and interior design that much of it has been preserved for visitors to enjoy today. It was owned by Samuel Mayo Nickerson, who served as president for the First National Bank of Chicago for 30 years. The home was designated a Chicago landmark in 1983 and the museum was established by Chicago native and investment banker Richard H.